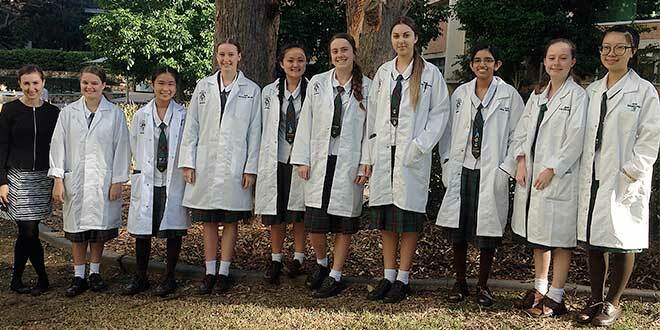 Scientific days: Lining up for science week were (second from left) Year 11 students Maria Harris and Katy Quach and from Year 12, Rachael Miller, Shyanne Nguyen, Jessica Marriott, Jovana Toplicanin, Diya George, Tia Chapple and Mandy Pei with teacher Lauren Stanton. STUDENTS from San Sisto College, Carina, were among more than one million people who participated in science events across the nation during National Science Week. San Sisto’s science academic leader Stuart Gillett said during the week students were presented with many opportunities, in and out of the laboratory, to discover and excel in science. “(At San Sisto) we help students learn how to develop a critical stance with their work and provide them with the ability to not just see the world the way it is, but to also to look further into the underlying truth,” he said. National Science Week featured more than 1000 events around Australia, including those delivered by universities, schools, research institutions, libraries, museums and science centres. San Sisto students in Years 7-10 joined this year’s initiative with the Year 10 students assigned a task to investigate the rates of chemical reaction and how these could be controlled while the Year 9 students were briefed on manipulating the current in electrical circuits. In comparison, Year 8 students were required to investigate respiration rates in yeast cells and Year 7s wrote a chemistry report about the effects of temperature on dissolving substances. Each project and the resulting report developed the students’ abilities to think flexibly, strive for accuracy, question and problem solve, gather data and to think with clarity and precision. In the Senior Science program, small classes allowed the college’s Science faculty team to cater for individual student needs, develop ideas and extend learning outcomes. The senior science students also worked with leading scientists outside and inside the classroom; by utilising staff and facilities of The University of Queensland’s International Moreton Bay Research Facility, when they attended a week-long Biotechnology immersion tour with the Translational Research Institute, and competed at Royal Australian Chemical Institute Titration competitions.